does any member knows the marking on the classic cover shown below? So far failed to identify it. If you could show the other side of the cover, it should say where it was sent from and give us a clue as to what the post office could be. I am currently on Business trip and do not have an image of the reverse side. Will post as soon as i can. Obviously an item from sometime after 1928 based on the one anna type II telegraph era stamp. At first glance, the "postmark" looks more like an institutional governmental office seal of some type rather than a true postal marking. I have seen a couple of covers with telegraph era stamps cancelled with similar seals that appeared to have been produced in the 1950's or 1960's to mimic a contemporary (1920's to 1930's) postal use of the telegraphic issues. This seal is different; but the general character of the cover is very similar which makes me suspect that it is probably a philatelic contrivance from a later era than the stamp would lend one to expect. 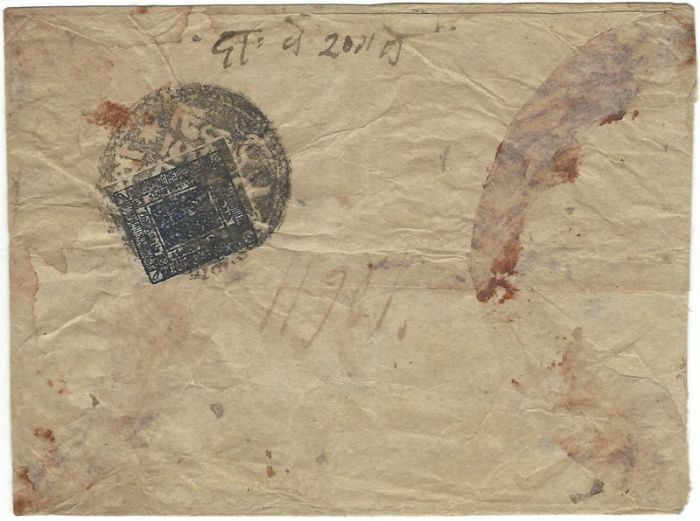 However, I learned a long time ago that virtually anything is possible when it comes to Nepalese philatelic material. Therefore, it is not impossible that it is a legitimate item. The information on the other side of the cover will hopefully help settle the issue. here is now the front side of the cover. Any help appreciated.